Girls have sleep-overs, boys have camp-overs. Now, I know what you are thinking. You are thinking they should have a camp-out. And under normal circumstances, I would agree. But, I have a hard time sending these boys out back to sleep when it is still in the high 90s and dark outside. So, we improvised. 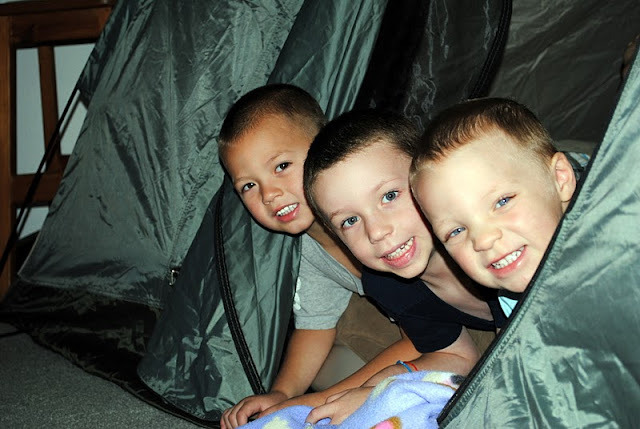 Joshua pitched the tent in the living room, blew up a big air mattress, and the boys were set! Camping in the cool and air conditioned house. There were three boys at the camp-over ages two, four, and six. I am either the coolest Mother ever, or the stupidest. I’m still trying to decide. But seriously, it was fun. The boys did a great job of making dinner and we all ate while watching a movie. 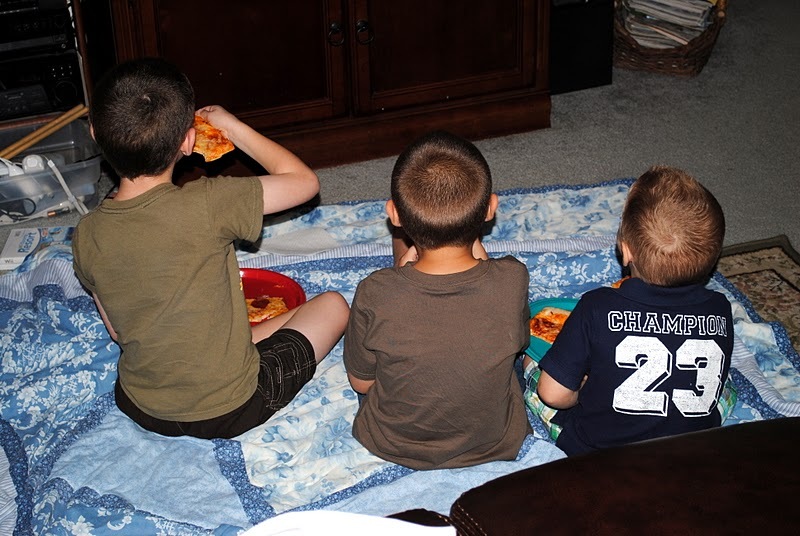 Those of you who know me well are wondering; did she really let those three boys eat in her living room? The answer is YES, I did. But, I put down a huge blanket and made them eat on it. I have not TOTALLY thrown caution to the wind! Little boys choice—we watched Superman, the original. The big boy was happy with the choice. And after the movie, it was time for showers and the tent. They all went right to sleep, no problems at all. I was not too surprised, I thought they would all do okay going to sleep. What did surprise me is that none of them woke up in the night. They all slept until about 8 the next morning. We got up, had breakfast and then were off to the aquarium. 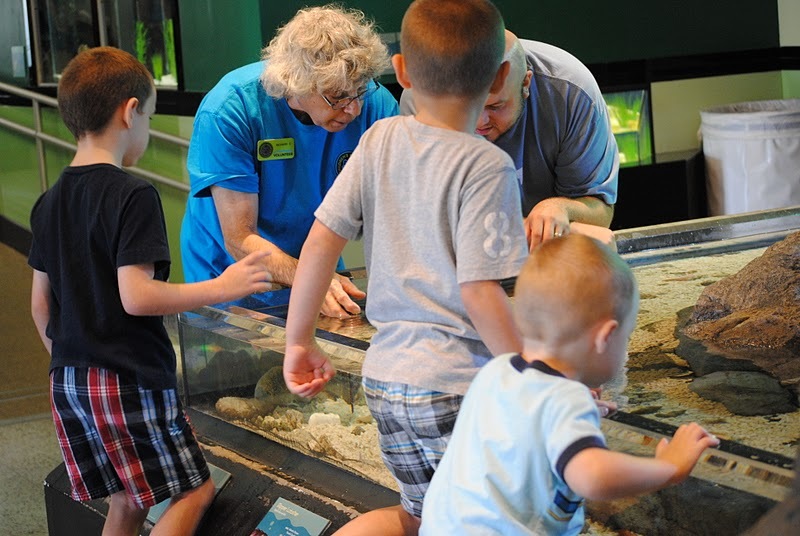 We had a great time looking at all the fish, sharks, sting rays, and even an octopus! After we were done there, we headed over to Chik-fil-a for lunch. As we were heading out the door I received a complement on what a lovely family I had. I smiled and thanked the lady and let her know only one boy was mine. She laughed and said, well, they just look like they could all belong to you and your husband. 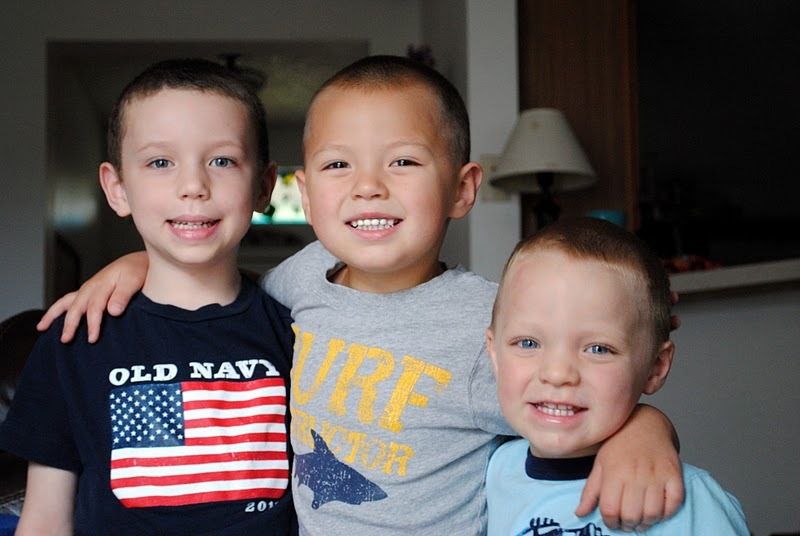 All three boys had a great time with each other and we loved having them over. 2 year old: Them are kissing on the lips. 2 and 4 year old: NASTY!! 2 year old: I shot yours ground dead!! Luke: Can I handcuff you? And my absolute favorite…the boys had built a fort in the hallway. The 2 year old had gone to the bathroom and did not bother to shut the door. Luke: The bomb, the bomb. RUN!! 4 years old: Get our friends! 2 year old from sitting on the toilet: Get the baby!!! !